When you think of carbon emissions, you probably think of the exhaust that comes from your car. But it comes from the ground, too. As the temperature continues to rise in the Arctic, Alaska’s melting permafrost is releasing carbon dioxide into the Earth’s atmosphere. A new report published Monday says CO2 is escaping in the wintertime at increasing rates. Róisín Commane is an atmospheric researcher at Harvard, and she’s flown a number of times over places like Bethel, Nome and Barrow in a plane that looks — as she describes it — like a FedEx truck with wings. The aircraft is small and boxy and outfitted with instruments that measure carbon dioxide. Commane says you can’t really see the CO2 hovering in the air. But you can feel it. “The plane will be bouncy. You make sure you have your coffee cup in your hand not left on top of anything because you never know when you could hit an air pocket,” she said. Most of Commane’s time in the state has been spent flying over it. Still, it’s the tundra that she’s really interested in. The soils in the northern parts of Alaska and Canada are extremely rich in carbon. She says it’s estimated that the frozen lands of the Arctic contain twice the amount of carbon dioxide currently in the Earth’s atmosphere. 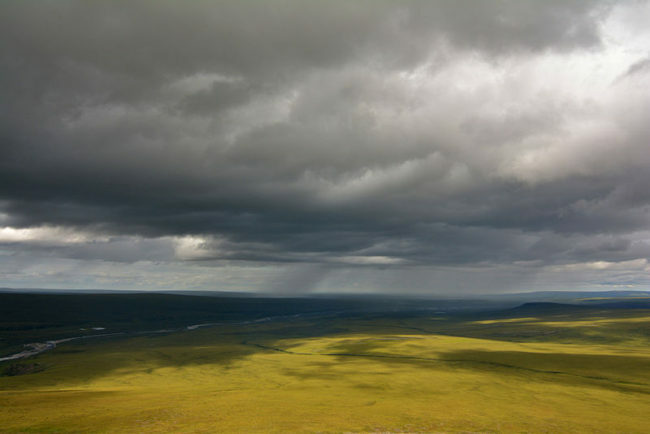 In the summer, some carbon dioxide escapes as the permafrost melts. But scientists have discovered it’s now happening in the winter, too. “I think the main reason we’re worried about this is because as the temperatures are increasing and we’ve been seeing that happening for the last few years, the amount of CO2 that’s going to come out will go with that temperature,” Commane said. She says it can be described as the climate equivalent to a dog chasing it’s own tail. As far back as the 1960s scientists thought this could someday be a problem in the Arctic. Eventually, they came up with climate models to help forecast the change. Some scientists think they can help fix the problem. Commane has heard of a Russian lab that wants to bring woolly mammoths back from extinction to stomp down the tundra, so it refreezes over. But she thinks that idea is far fetched. She says for the Arctic, there appears to be no turning back. The one thing she can do is collect more data on the Arctic. She says it’s important for scientists to continue to track the changes to come.